These two caves, although closely situated to one another, are very different in their appeal. 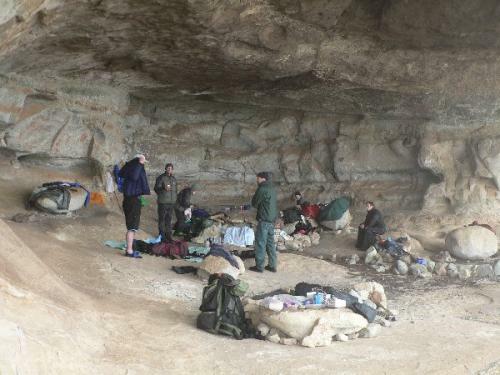 The more easterly cave is in a narrow, shallow gorge and has a messy floor and a poor outlook, but is closer to a good water supply and will provide far better shelter in bad weather than the main cave. The outlook from the vicinity of the main cave is quite unique, and offers a variety of scenery ranging from fantastic rock formations to grassy plains, and almost unlimited views of the escarpment from north to south on a clear day. 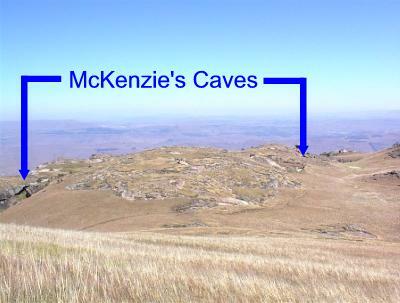 The Mkhomazi Wilderness Area lies on the south-eastern side of the Giant's Castle Wilderness Area, and south of Highmoor. Although it has many special attractions, including a boulder-strewn valley covered in aloes, Mkhomazi has been sadly neglected and is littered with deep erosion scars and large bramble patches. As one of its main attractions, the route to these caves has - unusually - been marked with white arrows painted onto rocks. 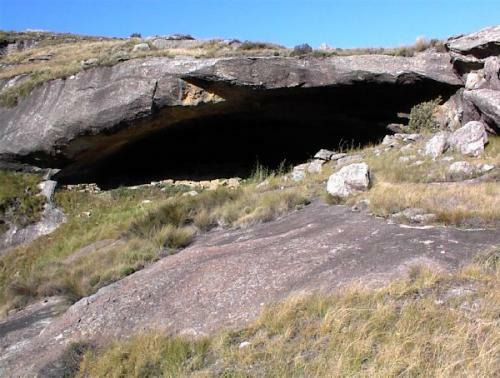 The smaller cave can accommodate about 5 people amongst its rock-strewn floor. 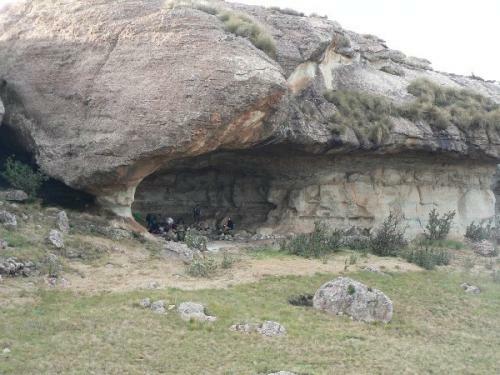 The larger, main cave can easily accommodate the maximum of 12, although in bad weather there may be some competition for space at the very back of the cave! The floor of the main cave is fairly level and divided into several small, level sleeping quarters. The floor covers a very large area and is mostly smooth, with nicely curved terraces that make comfortable seating and cooking areas. The area immediately in front of the main cave is covered in patches of soft, comfortable lawn. There is a small stream that meanders through the grass about 50 metres below the main cave, but in winter this often dries up completely. The next nearest stream is the one which runs past the smaller of the McKenzie's Caves, in the little gorge behind the main cave. To reach this stream requires a walk of about 200 metres over mostly level ground. Should water still be a problem, there is a still larger stream about 500 metres away towards the escarpment, which also does not require much effort to reach, and has some interesting attractions of its own. The nearest pools are in the gorge behind the main cave, overlooked by the smaller of the McKenzie's Caves, but the best pools are to be found in the larger stream about 500 metres away. The main cave has a very substantial overhang but the front end is very exposed to the wind and driving rain. In conditions such as these you will find that the smaller cave offers far better shelter. The main cave overlooks a small, almost level plain, beyond which a small rise hides another far larger plain. To the left of the cave opening are some fascinating rock formations and two gorges which open to the farmland in the distance. 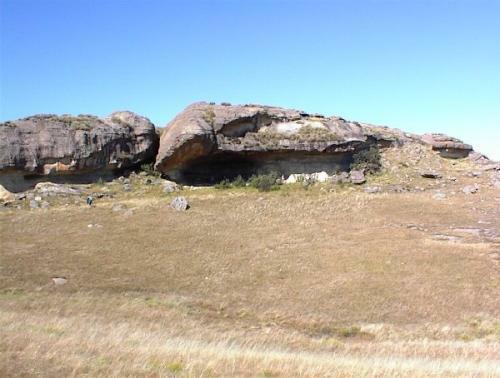 A short walk to the rock formations above the cave will expose - on a clear day - a view of the entire Drakensberg range from the Devil's Tooth in the north to the Devil's Knuckles in the south, a distance of some 200 kilometres! 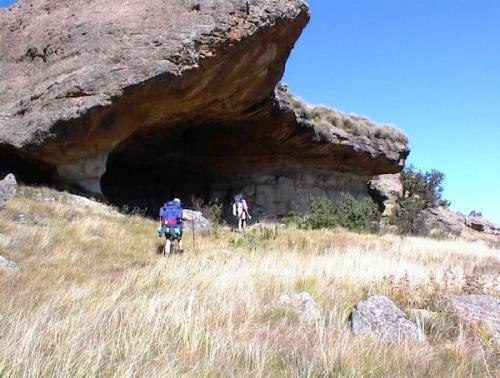 The whole area surrounding the caves offers exciting opportunities for those who enjoy exploring.